FIVE 1hr lectures direct from our indoor arenas using real riders and horses to demonstrate how the rider's skill can influence the shape of the horses back and cause them to move into 'The Seeking Reflexes'. Includes a 90 minute bonus lecture on the basics! If you want to buy the course as a gift for someone else you can purchase a digital gift card directly from our shop. 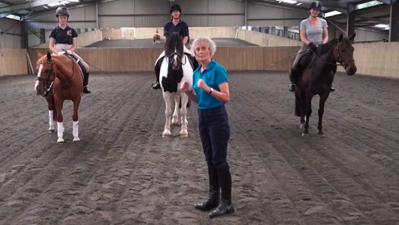 This lesson sets out the rider's job in the front/back, side/side and up/down plane - it also investigates the typical effects of errors in each of these planes using live demonstrations. In this lecture we look at the typical mental problems that prevent riders from focusing correctly and that cause riders to try too hard. We will also look at the correct training ethos for 'On The Bit' which will help set correct expectations for the rider. Here we look at a range of typical scenarios which can prevent your horse working in the seeking reflexes and how to go about solving those problems. Again we will use live demonstrations to show problems and corrections. How can we make good transitions from one gait to the next? What do we need to think about when generating additional impulsion? These kind of questions will be answered in this module. Additionally we will look at any specific problems members tell us they are experiencing. If anyone has been on our previous courses you know that we don't hold back. So you can expect all kinds of additional videos and other bonus material during the course.